The word “FOMO” may be new to some people, but the feelings it’s attached to I guarantee isn’t new to anyone. FOMO stands for Fear Of Missing Out, and it’s something I have had to learn to overcome. FOMO is almost like a disease, it hits you hard and it can make you feel inadequate, lost, and can even lead to bouts with depression. Social media does nothing but feed FOMO. People posting about all the beautiful places they are, while you sit on the couch, a pint of ice cream deep, lusting at their photos, realizing that you have to show up for work in an hour. I get it, I’ve been there, and it’s tough to overcome those feelings of wanting to belong, wanting to live or be elsewhere at any given moment, wanting the life that someone else has. In this blog post, I’m wanting to share some tips that have helped me not be bound by the bitterness of FOMO any longer. Focus your energy on what you have! If I have learned one thing, it’s that we oftentimes like to remember what we had (or wishing for what we don’t have), but it’s important that we don’t forget to love what we have. Vacations and reminiscing are fun, lusting over others experiences and adventures are also fun, but life is full of new directions and spontaneity, and if you’re living in FOMO from your past experiences or what you wish you were experiencing, you’re not really allowing yourself to live. There is a heck of a difference between being alive and actually living. Also, if you find yourself scrolling through Instagram or Facebook, jealous of all the adventures people all over are having that you feel you aren’t, remember, adventure is the life and light within yourself, you can find or make it anywhere. You don’t have to climb the tallest mountain, dance in the biggest waterfall, or go swimming in the wide ocean. Adventure can be as simple as just taking a hike on a local trail, taking in the fresh air and sounds of nature, or driving to a new town and exploring all its offerings. For me, currently living out East is beautiful, but I find myself entrapped in a world where I want to be exploring the West. I get jealous as I mope around in this fantasy land, so much that I forget to take a look at everything that is around me. The East is home to clear streams, greenery as far as the eyes can see, waterfalls of all shapes and sizes to fill your hearts desires. We may not have the biggest peaks, but the views and the climbs are still worthwhile. I realize how much I take for granted, how many people that live in the West are jealous of my adventures in the East, and I have to talk myself into just taking it day by day. Limit your social media usage! Social media can be engaging and fun, but it also can be disheartening and time consuming. If there’s one treatment for the feelings of FOMO, it’s to limit your social media usage. I allow myself 2, 30 minute “scrolling sessions” a day. Basically, if I’m going to make a post on Instagram, I do it within that time frame. I respond to any comments or messages within that time frame, and I utilize the time that is left to discover and engage with other people’s content. Limiting social media has not only helped me distance myself from the feelings of FOMO, but it has enriched my life because I am no longer comparing myself to others, I’m no longer seeking to validate or justify why my life is the way it is, and I’m utilizing that time to better myself and my own adventures. Feeling the FOMO? Get out a pen and paper and set yourself some goals! Earlier this year, I was being tormented by all the gals on my Instagram feed completing the Six Pack of Peaks, and dang, was I jealous of those climbs! I talked myself out of being down about it though, and I’ve realized the best way to move forward is by setting attainable goals for myself. So instead of the Six Pack of Peaks, I am now working on the Georgia 32, 4000’ Peak Challenge and have been bushwhacking, trailblazing and navigating my way through the highest peaks in the Southern Appalachians. I’m now often so focused on my next adventure, I don’t have the time or energy to feed the jealousy attached to FOMO. Lauren is the Ambassador for our Georgia chapter. 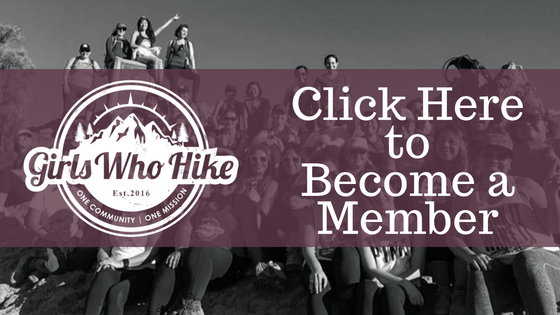 To join her local meet ups and discussions through Girls Who Hike Georgia, click here.